Neil Armstrong was a class act. As the first man to walk on the moon, he was quiet, reserved, never sought notoriety and didn’t crave attention. He preferred to live a peaceful life back home in Ohio after leaving the astronaut corps. As a young man, he earned an engineering degree at Purdue University, served in the Navy for three years as an aviator, including 78 combat missions during the Korean War, and then became an experimental aircraft test pilot at Edwards Air Force Base as a civilian. During his time there, he flew the X-15 rocket plane right to the edge of space, more than 207,000 feet above the earth. In 1962, Armstrong joined NASA in its second group of astronauts, dubbed “the New Nine,” which also included Jim Lovell, Frank Borman, John Young, Ed White, and Pete Conrad. Armstrong’s first mission came in March 1966 as commander of Gemini 8, during which he proved his extraordinary skill as a pilot. The mission’s goal was the first docking in space, and after the successful dock with an Agena target vehicle, Armstrong’s craft began spinning wildly out of control. He undocked from the Agena, hoping it would stabilize his ship, but things got much worse. Rather than panic, he kept his head, fired his re-entry boosters, righted the capsule, and saved both the ship and his crew. After serving as backup commander of the famed Apollo 8 mission, the first to leave earth’s orbit and fly out to the moon, Armstrong was selected to command Apollo 11, the first mission to attempt a lunar landing. Controversy soon erupted over which astronaut would take the first step onto the moon’s surface, Armstrong or lunar module pilot Buzz Aldrin. But because of the LM’s layout, it would be Armstrong, the civilian, who would take the most historic step in world history. In 1971, he left NASA, never flying in space again. He taught aeronautical engineering at the University of Cincinnati until 1979, and later had several successful business ventures. 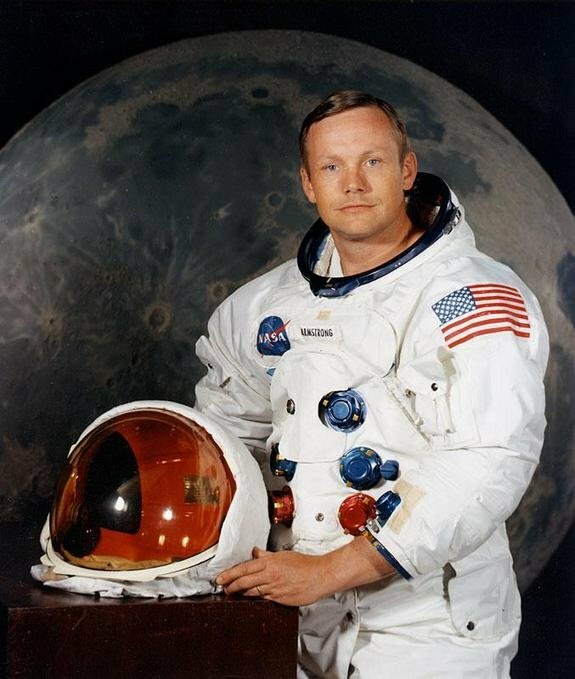 Not long after the success of Apollo 11, he stopped signing autographs, because he quickly saw how people were profiting off his name, nor did he write memoirs to glorify his accomplishments. His strong character and lack of narcissism made him the perfect person to take that famed step. Though he may have shunned glory, Armstrong will live throughout the ages. Should our civilization last another 1,000 years, his name will endure. No matter what great accomplishments mankind may achieve in space, whether it be landing on Mars or traveling to other planets across our galaxy and beyond, Neil Alden Armstrong will always be the first human to set foot on another celestial body. He was a true American hero. But as historic of a figure as he was, he died as quietly as he lived, with very little news coverage of his death over the weekend. Yet I believe that’s exactly the way he would have wanted it. This entry was posted in History and tagged American history, NASA, Neil Armstrong. Bookmark the permalink. ← Are we still providing for the common defense? He was a great man and it is a great loss. There will never be another like him.